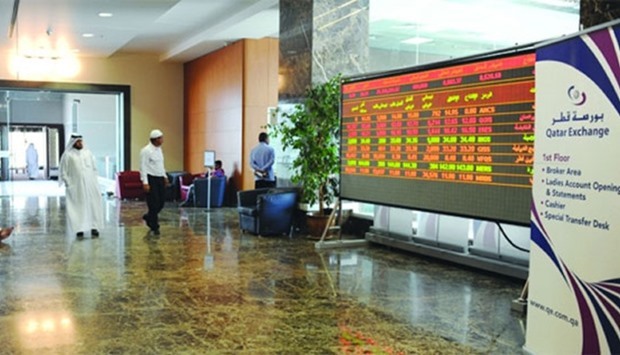 The Qatar Stock Exchange on Tuesday plummeted 134 points to settle below 10,300 levels, mainly dragged by strong selling in real estate, banking and telecom equities. 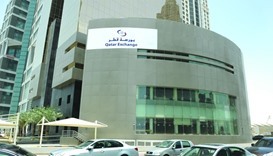 Foreign funds and Gulf individuals were seen bearish as the 20-stock Qatar Index declined 1.29% to 10,233.88 points. 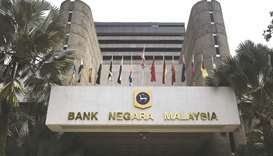 There was also decreased net buying support from domestic funds in the market, which is up 20.07% year-to-date. Market capitalisation eroded about QR9bn or 1.44% to QR583.61bn mainly pulled down by mid and microcap segments. 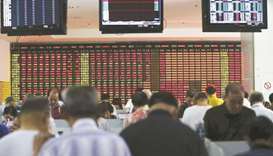 Islamic equities were seen declining slower than the other indices in the market, where local retail investors turned bullish. Trade turnover and volumes were on the decline in the bourse, where industrials sector alone accounted for about 73% of the total volume. The Total Return Index shed 1.29% to 18,030.96 points, Al Rayan Islamic Index (Price) by 1.12% to 2,380.67 points and All Share Index by 1.42% to 3,046.65 points. The really index tanked 2.7%, banks and financial services (1.55%), telecom (1.39%), industrials (1.24%), transport (0.62%) and consumer goods (0.11%); while insurance gained 0.71%. 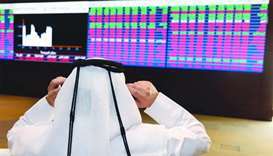 More than 79% of the traded stocks were in the red with major losers being Ezdan, Mazaya Qatar, QNB, Qatar Islamic Bank, Commercial Bank, Masraf Al Rayan, Qatar First Bank, Qatar Oman Investment, Industries Qatar, Gulf International Services, Ooredoo and Nakilat; even as Ahlibank, Qatari German Company for Medical Devices, Qatar Insurance and Qatar General and Reinsurance were among the gainers. 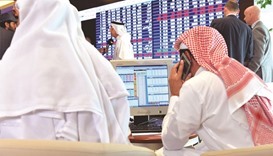 Non-Qatari funds turned net sellers to the tune of QR0.68mn against net buyers of QR59.68mn on December 24. The Gulf individuals were net sellers to the extent of QR0.66mn compared with net buyers of QR2.34mn on Monday. Non-Qatari individuals’ net buying declined influentially to QR0.55mn against QR7.55mn the previous day. Domestic institutions’ net buying also fell perceptibly to QR2.43mn compared to QR4.75mn on December 24. However, local individuals turned net buyers to the tune of QR1.94mn against net sellers of QR46.05mn on Monday. 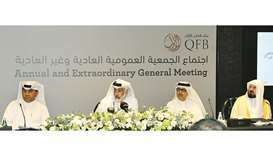 The Gulf funds’ net profit booking weakened substantially to QR3.59mn against QR26.34mn the previous day. 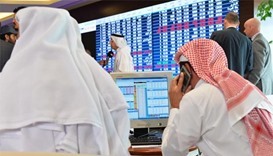 Total trade volume fell 35% to 7.63mn shares, value by 52% to QR113.05mn and transactions by 40% to 4,885. The insurance sector’s trade volume plummeted 81% to 0.09mn equities, value by 78% to QR2.9mn and deals by 79% to 56. The telecom sector reported 66% plunge in trade volume to 0.12mn stocks, 76% in value to QR1.33mn and 56% in transactions to 74. 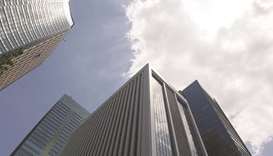 The real estate sector’s trade volume tanked 53% to 0.49mn shares, value by 45% to QR9.2mn and deals by 49% to 254. 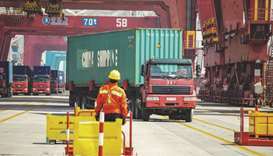 The market witnessed 48% shrinkage in the transport sector’s trade volume to 0.22mn equities, 50% in value to QR4.35mn and 46% in transactions to 177. 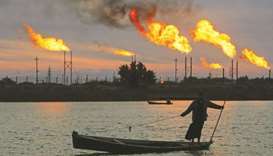 The industrials sector’s trade volume shrank 31% to 5.56mn stocks, value by 41% to QR74.35mn and deals by 39% to 3,612. 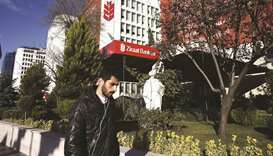 The banks and financial services sector saw 28% decline in trade volume to 0.93mn shares, 72% in value to QR16.01mn and 31% in transactions to 529. 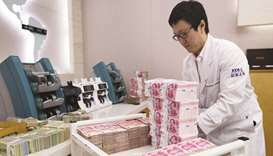 Although the consumer goods sector’s trade volume was flat at 0.12mn equities, value contracted 36% to QR4.91mn despite 12% higher deals at 183.